Located on the southern shore of Lake Ontario, our vineyards get the benefit of warmer water to prevent late spring and early fall frost to extend our growing season. This, combined with owner Fumie Thorpe’s instinct for science, has resulted in one of New York’s best kept wine secrets. Known by many as “the Little Winery on the Great Lake," Thorpe Vineyard has been 100% woman owned and operated, and producing award-winning wines since 1988 primarily from the grapes grown in the estate vineyards. Our outstanding wines range from dry vinifera varietals to sweeter New World blends. White wine Fialka is our current leader of the most awarded. Other customer favorites include semi-dry Riesling, sweet Lake Breeze and fabulous red, Maréchal Foch. With the wide variety of dry, semi-dry and sweet, we are confident to amuse everyone’s liking. 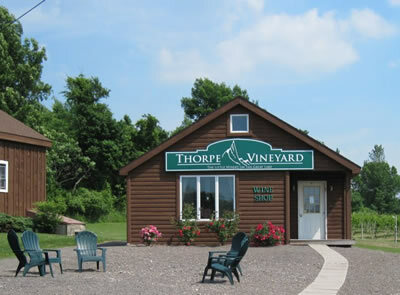 So consider a road trip to visit Thorpe Vineyard, located ½ mile east of Chimney Bluffs State Park on the east side of Sodus Bay. The breathtaking view, fresh lake air, and a chance to visit our cozy tasting room make it all worthwhile! Thorpe Vineyard is honored to be neighbors of Chimney Bluffs State Park, so we have encorporated the bluffs into our logo. The State Park offers visitors a unique and memorial experience. The bluffs were formed by a glacial drumlin, which has been eroded away by wind, lake waters, rain and ice; forming razor-like edges. Drumlins are common for Western and Central NY, but one that is sliced in half like this is pretty rare. 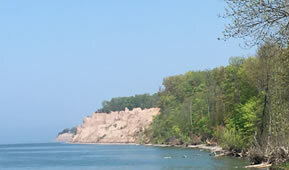 There are only three large examples of this in the region, with the Chimney Bluffs being both the largest and the most accessible. The park also has a large, undeveloped pebble beach where visitors can wade in the water, hand launch boats, or fish. The picnic area is fairly new and features solid tables and a large mowed area for lawn games. Nature trails wind in an out of hundreds of acres of wooded inclines and one extends to the wetland across the street; an excellent bird-watching location. In recent years reestablished habitation of Bald Eagles has been confirmed.